This playful pair are Ja-coreyan and Honesty. Don’t they just grab your heart with their smiles? Ja-coreyan loves to play sports and help whenever he can. Honesty is more of a dolls and dress up kind of girl. She is sweet and loving and enjoys playing with others. They both love burgers and any kind of fast food. This pair is not without their struggles, but they have learned to rely on each other for love and support. Honesty and Ja-coreyan both struggle with defiance at times and need to be redirected. These behaviors are improving for both of them with consistency and structure. 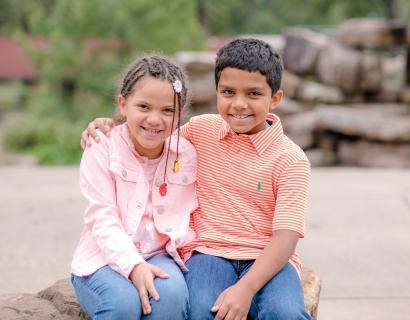 Their forever family will need to be an understanding, structure-loving two-parent home to help teach them positive behaviors and how to process through their emotions. If you have time to buy a couple of happy meals and a big mac, you’ll have the magic combination to these kids’ hearts and just the right amount of time to fall in love with them. Are you their forever family? Feel free to inquire below.